Camp Little Tooth Pediatric Dentistry Grand Opening! 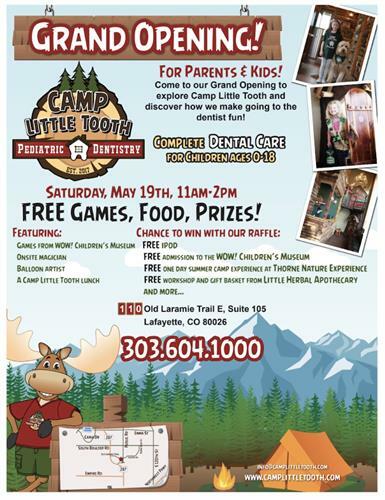 Join us to celebrate the Grand Opening of Camp Little Tooth Pediatric Dentistry! We will have FREE food, games and prizes. Featuring games by WOW! Children's Museum, a magician, and balloon artist - lots of fun for the whole family! We will also be raffling off a free Ipod, free admission for 4 to the WOW! Children's Museum, a one day summer camp registration at Thorne Nature Experience, gift basket and free workshop from Little Herbal Apothecary and more! Come and find out why going to the dentist at Camp Little Tooth is fun!